Theatre has always had a complicated relationship with diversity. Can any production satisfy an audience by portraying men and women, black and white characters, characters from across the entire LGBTQ+ spectrum, all at once? The answer here is probably no, as specifically focussing on all of these groups couldn’t fit into two and a half hours. So how diverse is theatre really? If we look at gender diversity, theatrical roles have experienced gender-bending throughout history. Back when Shakespeare was writing for the Globe, most female roles were played by men, for no other reason than because it was illegal to have women in the theatre. Of course, we have progressed massively in gender equality since then, and we now see cross-gender casting occurring for any number of reasons, especially in plays – and, in keeping with the trend, particularly with Shakespeare. In 2012, an all-male production of Twelfth Night starring Stephen Fry and Mark Rylance was awarded several five-star reviews for its brilliant ensemble work, and Donmar Warehouse’s all-female Shakespeare ‘trilogy’ of Julius Caesar in 2012, Henry IV in 2014 and The Tempest in 2016 was critically acclaimed as paving the way for gender-blind casting. Turning to other writers, in 2017, an all-male production of Oscar Wilde’s The Importance of Being Earnest in Belfast was heavily criticised over its trailer, which allegedly aggravated the gay stereotype. Yet last year’s all-male tour of Gilbert and Sullivan’s Iolanthe – its setting adapted to its casting as a group of naughty school boys are transported to a magical world – saw a fantastic reception. Is it how the subject matter is handled, therefore, that makes the difference? 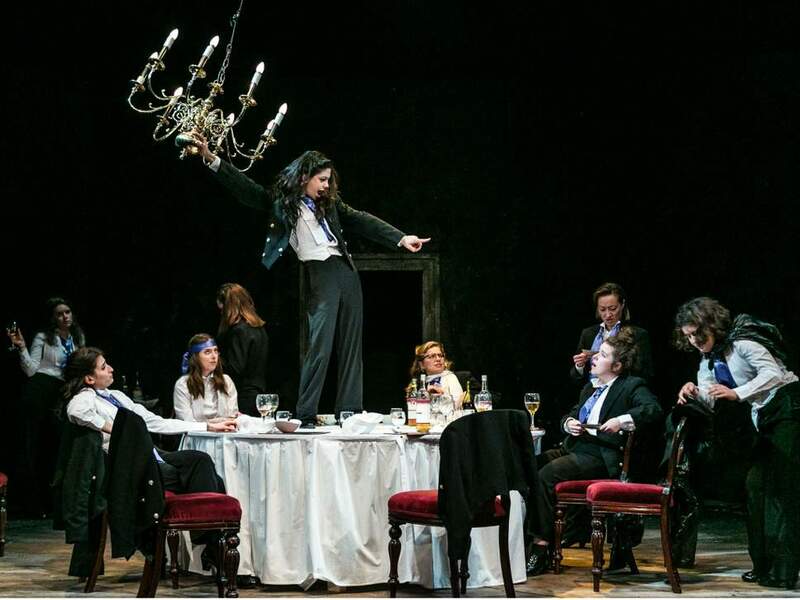 Notably, it is rare to see this sort of criticism for all-female productions, for instance 2017’s all-female production of Posh, a play about the exclusive, men-only, Bullingdon club at the University of Oxford which became the source material for the 2014 film, The Riot Club. While it might seem bizarre that women should play such outrageous, entitled young men, it seems as though this casting was better received than that of the original 2010 production. And then there are plays specifically written with all roles of the same gender: Caryl Churchill’s Top Girls is being revived at the National Theatre this March, and the Old Vic production of The Inheritance, which features a predominantly male cast, recently ended its West End transfer. Are such plays problematic for not featuring a more diverse cast, at least in terms of gender? Personally, I don’t think so. Regarding racial diversity in casting, just over two weeks ago Brittney Johnson became the first black actress to play Glinda in the Broadway production of Wicked, the first time a black actress has played the character in any English-speaking production of the show. The Broadway production has been playing for over 15 years now, so this is a massive step in the right direction for colour-blind casting. But while the industry is making progress in this kind of casting, with more and more black actors being cast in roles where a character’s race is irrelevant, there are of course productions in which actors from racial minorities are intentionally cast. The most obvious of these is Hamilton, Lin-Manuel Miranda’s global hit, in which the non-white casting of key historical figures from the American Revolution is colour-conscious rather than colour-blind. I am one of the few people on Earth it seems who does not rave about Hamilton: I adore Miranda and his work, and I enjoyed the musical when I saw it in London, but there is something fundamentally problematic about it. The problem comes when a well-known historical figure like George Washington, who was a renowned slave-owner, is portrayed by a black actor: it asks the audience to forget history. Would it not be more representative to portray figures from the revolution who were actually black or from another racial minority, and focus on them? Perhaps this is naïve thinking, though, as undeniably most of the famous figures from the Revolution were white, and I cannot disagree that the show is a huge milestone in musical theatre history, especially in terms of diverse casting. As for the inclusion of LGBTQ+ roles, many gay and lesbian roles exist, but more could be done within the industry to represent the entire community. Perhaps this is the next boundary to cross: more plays and musicals written including sexualities other than heterosexual and homosexual, and more productions casting transgender actors, which is something we see very little of. Diversity in theatre is always a tricky subject: should casting be gender/colour-blind or conscious? Does the subject matter call for a change in casting? Should we just leave old work as it is and focus on making new work more inclusive? Theatre exists to represent the human experience in one way or another; ultimately, diversity in theatre should be utilised to represent everyone. Watch the trailer for Hamilton below.